Cookies are small data files that websites save to your computer or device to store information. This information is used for actions like signing into a website or storing items in a shopping cart. We showed you how to delete cookies in Chrome and Firefox on your computer. You can also remove cookies on your iOS or Android device. 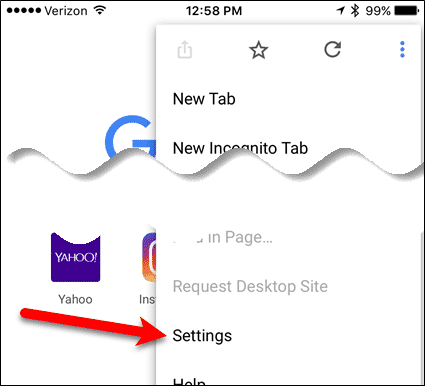 To remove cookies in Chrome on iOS or Android, tap the menu button (three vertical dots). 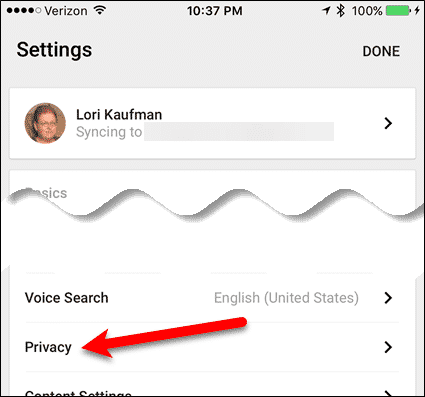 On the “Settings” screen, tap “Privacy“. 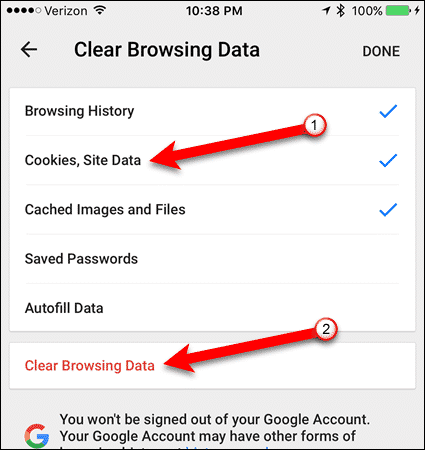 Tap “Clear Browsing Data” on the “Privacy” screen. 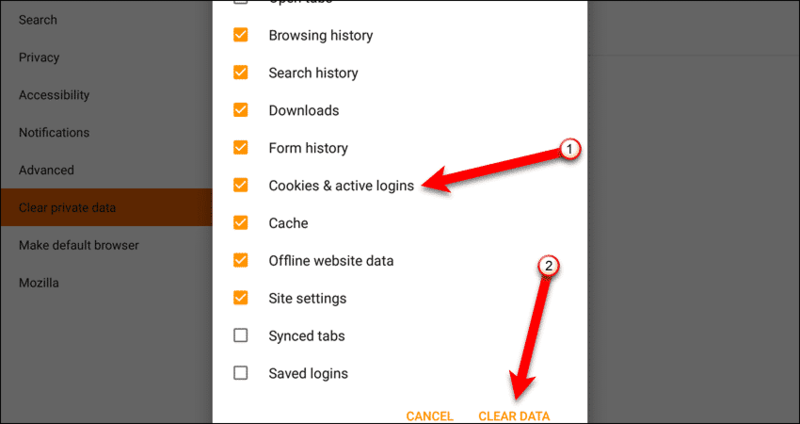 Make sure “Cookies, Site Data” (“Cookies and site data” on Android) is selected on the “Clear Browsing Data” screen. Select any other data you want to clear. 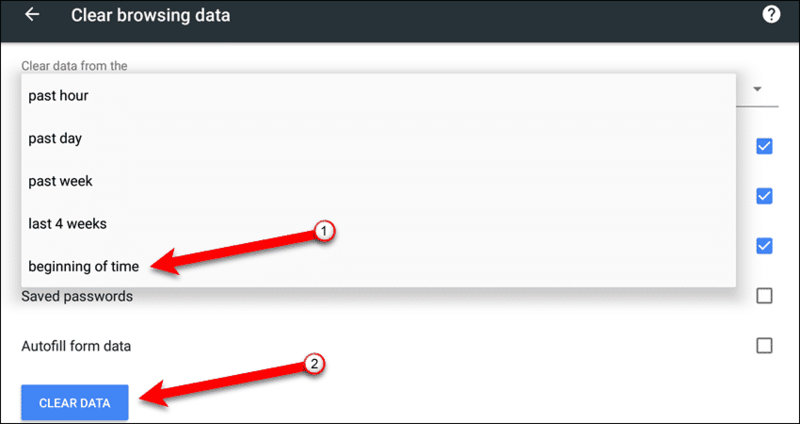 Then, tap “Clear Browsing Data” (“Clear Data” on Android). 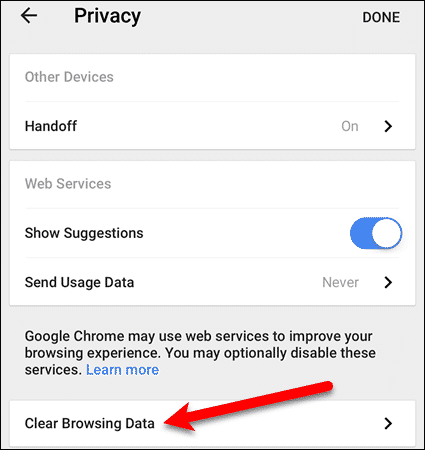 On Android, Chrome has an extra option when clearing browser data. 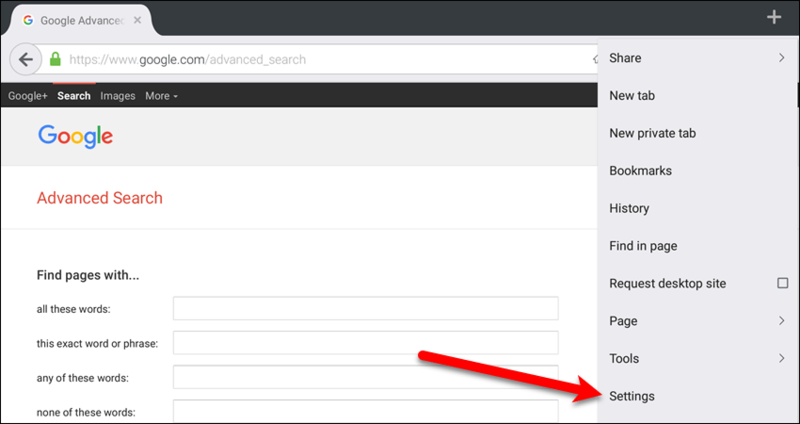 Select the time frame for which you want to clear browser data from the “Clear data from the” drop-down list. You’re returned to the “Privacy” screen automatically once the data is cleared. 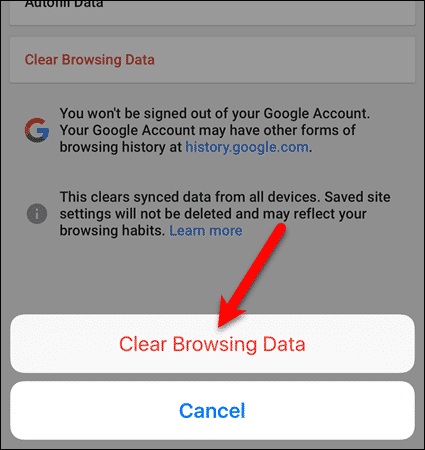 On iOS, tap “Clear Browsing Data” again. Then, tap “Done” at the top of the “Clear Browsing Data” screen. Removing cookies in Firefox is different on iOS and Android. 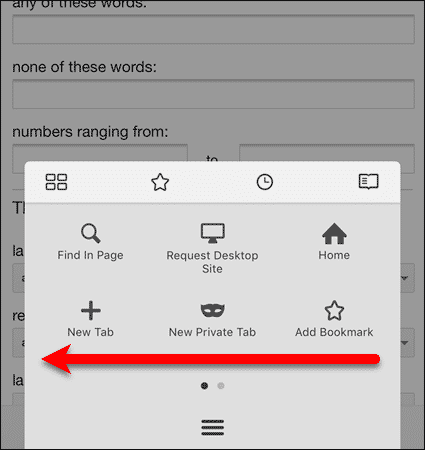 To remove cookies in Firefox for iOS, tap the menu button (three horizontal lines) at the bottom of the screen. Swipe to the left on the popup dialog box. Then, tap the “Settings” icon. Tap “Clear Private Data” on the “Settings” screen. 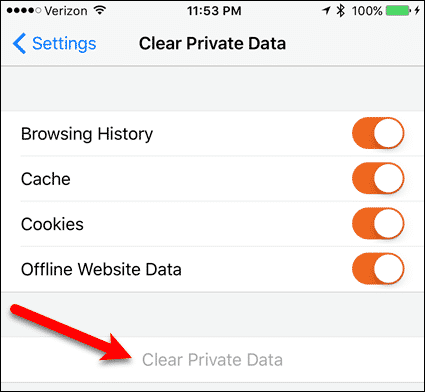 On the “Clear Private Data” screen, make sure the “Cookies” slider button is on (orange). Turn on other options as desired. Then, tap “Clear Private Data“. A warning dialog box displays. 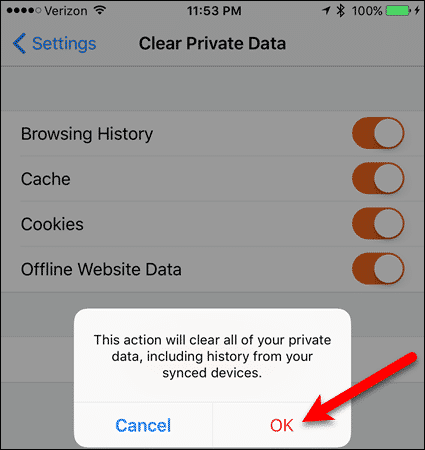 If want to clear all the selected data, including history from your synced devices, tap “OK“. 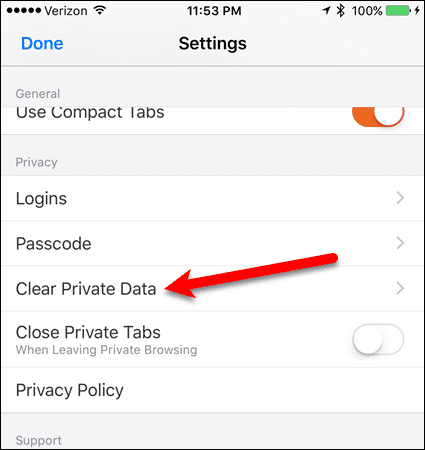 Once the data is cleared, the “Clear Private Data” option is grayed out. 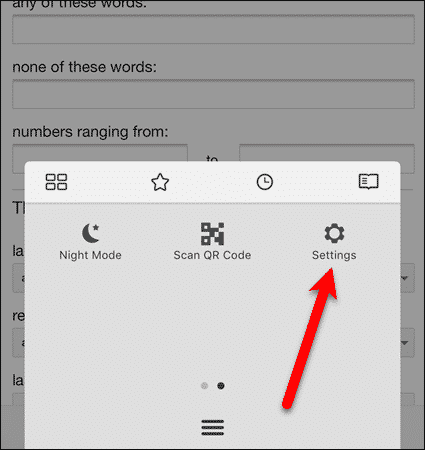 To remove cookies in Firefox on an Android device, tap the menu button (three vertical dots). 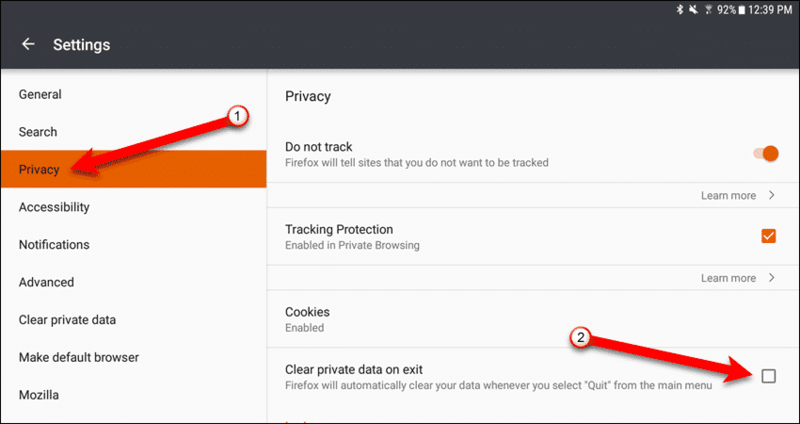 If you want to remove cookies automatically when you exit Firefox, tap “Privacy” on the left side of the “Settings” screen. 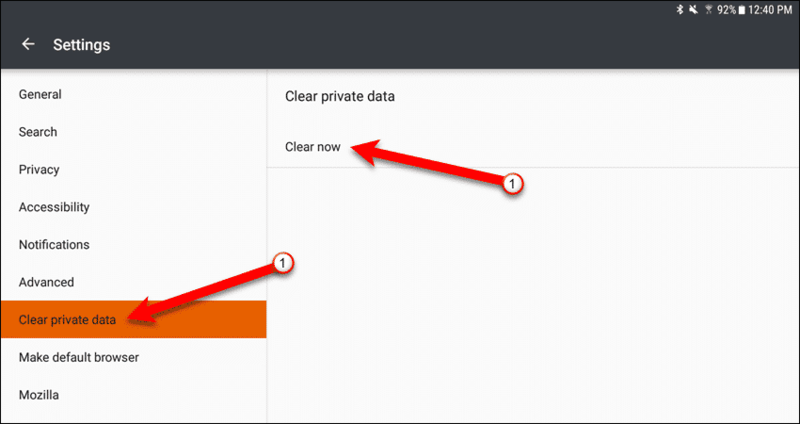 Then, tap the “Clear private data on exit” check box. On the “Select which data to clear” dialog box, make sure the “Cookies & active logins” box is checked. Check the boxes for any other items you want to clear on exit and then tap “Set“. 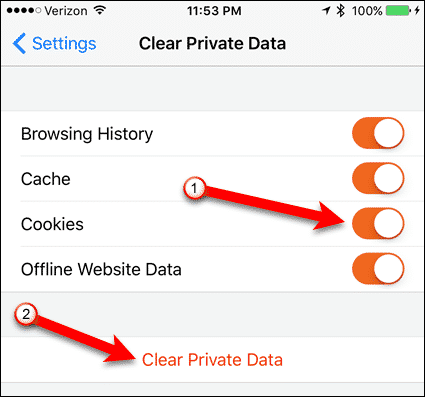 To remove cookies immediately, tap “Clear private data” on the left side of the “Settings” screen. Then, tap “Clear now” on the right. 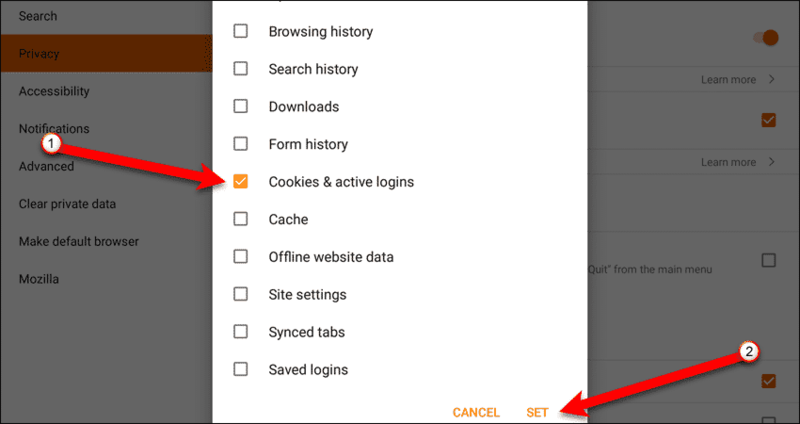 On the “Clear now” dialog box, make sure the “Cookies & active logins” box is checked. Check the boxes for any other items you want to clear and then tap “Clear Data“. A message saying the private data is cleared displays at the bottom of the screen. How often do you remove cookies and other private data from your mobile device? Do you remove cookies manually, on exit, or both? Let us know in the comments.